Another good TV clip featuring interviews with Robert Hernandez, Phil Arnold, Mark Robbins, and Bob Dubuisson. This is one of the best TV news segments ever done on the sport of air hockey. Featuring interviews with Phil Arnold, Robert Hernandez, Jesse Douty. Classic 4-minute TV news show segment from the very first USAA Nationals at Fair Lanes in Houston, TX. Features Ron Franklin interviewing Phil Arnold, Jesse Douty, Rolf Moore, Mike Barry, Mark Robbins. 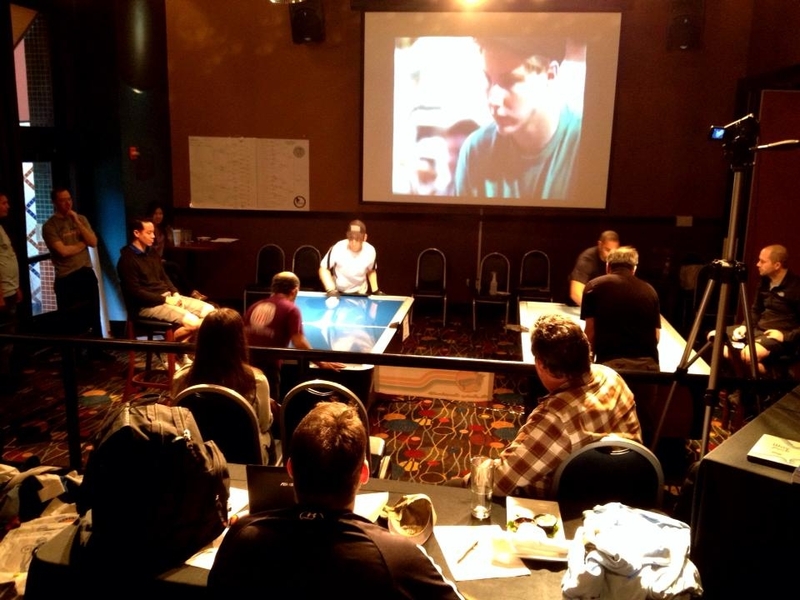 A video of the instructional clinic conducted by Billy Stubbs and Ehab Shoukry at the 2013 World Championships has been uploaded to the new Gold Standard Air Hockey youtube channel! Billy was the 2012 World Champion and is a 3-time World Champ known for his extensive and comprehensive study of the game. Ehab Shoukry is a 2-time World Champ known for having one of the best defenses of all time. This video is raw footage of the clinic, so it is unedited. The audio is not ideal because Billy and Ehab were not miked for the presentation, just a regular boom mike was used. Nevertheless there are valuable insights here for players at all skill levels. Billy focuses on offensive strategy and shot releases, while Ehab talks about defense. The following article was written by Jacob Weissman. It incorporates a 1996 article on face-offs by Don James, who might be called air hockey’s leading scholar of face-off strategy. 🙂 Note that Jacob’s article was written before the 2013 World Championships, so at the time of writing Billy Stubbs was World Champion. When we compare the Air Hockey of today to the Air Hockey of the 1990’s, it is easy to see that much has changed. The sport used to be based around careful, methodical deception. You beat your opponent slowly, as in a chess match, a tactic innovated mostly by Jesse Douty and then perpetuated by Tim Weissman in the early 90’s. After this, the Air Hockey textbook “tactic” became an incessant onslaught of deceptive attacks, like timed chess, meant to absolutely cripple your opponent, something innovated in part by Tim Weissman and then Danny Hynes in the early days of the new millennium. Today, Air Hockey stands on the precipice of a new innovation, the overwhelming, face-paced play style of Billy Stubbs. His new innovative style is not only extremely up-beat, based on fast drifts and faster release, but it relies mainly upon the positioning of the puck for deception. In the past the main forms of deception were time-delays and pump fakes, now more and more it is becoming about positioning. The theory is that if your releases are identical, and your tempo relatively upbeat, your opponent has no hope of keying in. Air Hockey is becoming more of a shoot-out now than a chess match. And yet, despite all this progress, there is one thing which has almost completely been lost in the fray: the face-off. Facing-off is a lost art, and is relatively ignored by the Air Hockey community today. In the 90’s, around the time of its conception as part of the start of each match, it was thought of as a great addition to the sport, an excellent way to give an extra layer of strategy and depth to Air Hockey, a strategy and depth which has since been forgotten. Currently in the world of Air Hockey, only Ultra-pros, most of them from the era when the techniques were being innovated, and a select few current day pros, use many of these strategies on a regular basis. As for experts and below, and many pros as well, these strategies are practically non-existent. Most players only hit and block the puck during a face-off, and this needs to change. Players need to think about and practice how to face-off. It is an important part of our sport, dictating who gets that critical extra possession per match. At higher levels of play, this could give a player the one last point they need to win the match. Yet, face-off strategy, rather than improving over the years, as have most aspects of Air Hockey, has rather degraded. This is something that could easily be improved, innovated just like the other aspects of Air hockey. All it takes is some attention from the community. In hopes that it will help inform the community, and save the neglected step-child of Air Hockey, the following is an excellent article by Don James written back in 1996. It outlines what were once considered to be the best “face-off” strategies. It is coupled with some current-day video examples of the techniques that Mr. James describes. Long live the face-off! Standard Opening- The easiest face-off strategy to use and learn is the standard opening. Simply put, all it is, is a basic shot (usually a bank shot) taken upon release of the puck. A normal (backhand) or a forehand bank is the most common shot attempted, although a double-bank can sometimes be employed ( especially effective against a poorly executed crowd opening). A quick release is vital to successfully using this technique. Long “Mike Barryesque” wind-ups before a shot are not acceptable, and if the opponent is using a standard opening of his own it will usually result in your being scored upon. Straight shots can also be effective, particularly against slower standard openings. The “crock shot,” invented by Brian Accrocco, is a push straight shot executed with no wind-up at all. This maneuver was developed to counter the Australian opening and more specifically the “Weissman pull.” The standard is the only one of the five basic openings which offers the possibility of a score, the others are just techniques to gain possession. Overall, the standard opening is the strategy which should be employed most often, for beginners and professionals alike . Australian Opening- the Australian opening (invented by Tim Weissman) is one of the best face-off maneuvers used today. In fact, the rules of the face-off were changed to limit the effectiveness of this very move. To execute the Australian, the player positions his mallet with a forehand grip directly behind (or maybe a little bit offset to the right) the puck. When the puck is released the player moves his mallet to the right of the puck at the centerline and then pulls his mallet to the left in a forehand motion, causing the puck to be pulled onto his side. The Australian is used to gain possession, it is not a scoring strategy. The Australian opening is all about quickness and anticipation. One drawback to the technique is that the less the maneuver is telegraphed at the outset, the harder it is to successfully accomplish. If the player starts (or even moves) to the right of the puck before the release, his opponent will no doubt know what is coming. The counter to the Australian is a quick standard opening, and specifically a “crock shot.” Australian vs. Australian results in a hand-smashing test of speed. An Australian opening is unstoppable against an Invitational or Crowd opening. The reverse Australian opening is performed from the backhand side, while the “Weissman pull” starts with the mallet in position and the hand cocked to the side of the puck. The Australian opening should not be employed by Amateur or below players against superior competition. Invitational Opening- the idea behind the Invitational opening is to force (or invite) your opponent to take a poor shot and then defend it. To execute the Invitational opening the player merley pulls back to his goal. The average shot taken off a face-off release is not nearly as hard to stop as a set-up shot, and therefore if one can get in defensive position fast enough, the Invitational is a deadly opening. A Siegeworth opening or overly aggressive Crowd opening is always defeated by the Invitational. This maneuver is very effective against lower skilled players, who tend to make poor contact with the puck upon release. The Invitational opening is also a very safe maneuver for beginning players to use. The Crowd Opening- The strategy behind the Crowd opening is to block the puck, forcing a deflected shot, which should rebound harmlessly on your side of the table. When the puck is released the player moves forward within 1/2” of the puck, in order to make contact with the puck after it is contacted by the opponent. The contact must not be direct or the puck will rebound straight back to the opponent’s side. The Crowd’s ideal use is to cut off the bank angles used in standard opening. The “Cabot Stand,” invented and used by Tarl Cabot, is a Crowd opening executed from the starting of 1 to 1/1” back. The distance from the puck in the “Cabot Stand” allows for an Invitational opening type “get” if the opponent clips the puck while still cutting off the bank angles with a slight reactionary adjustment. However, the double bank is wide open and an Australian becomes even more effective. The Crowd opening will usually defeat the more passive Invitational opening because the puck stays closer to the mallet during the Crowd, allowing for a quick switch to an Australian pull or standard shot. This opening is effective against all levels of competition, but should be avoided against players who prefer the Australian opening. Siegeworth Opening- The Siegeworth opening, invented by Evan Siegeworth, was developed primarily to defeat Crowd-type openings. To execute the Siegeworth opening the player shoots the puck directly into his opponent’s mallet in order to have the puck rebound back to him. The release of the puck should be a quick tap or flick type of shot executed from a straight-up position. If the player is quick enough, the Siegeworth opening can defeat any opening except for the Invitational, which will usually result in an easy give away. The Siegeworth is an advanced technique recommended for experienced players only. Even knowing all of these techniques, the key to face-offs lies in the execution. Intimidation, anticipation, knowing your opponents tendencies, bluffing, and knowing how to deal with the false start are areas which play a role in more advanced strategy. The invention of new openings and derivatives of these will no doubt lead to better and more exciting air hockey. Siegeworth open: http://vimeo.com/album/2299270/video/61643219 In this clip, world champion Danny Hynes quickly taps the puck off of Billy Stubbs’ mallet before Stubbs can even react, reflecting the puck so that he Hynes gains an easy possession. Here we see Danny exemplify what it is to simply move faster than your opponent, contacting the puck before they do. This is a basic fundamental of the face-off, especially when attempting the Siegeworth Open, which thrives on speed and finesse. Crowd Open: http://vimeo.com/album/2299270/video/61643293 By keeping his mallet about 1” from the puck, Dan Meyer is able to deflect Danny Hynes’s attempted Standard opening and “get” the puck. Australian Open: http://vimeo.com/album/2299270/video/61643294 Here Dan Meyer uses the Australian open to “pull” the puck quickly to him before Romero Castano can even hit the puck. Notice that, although he pulls the puck with a quick forehand like movement, he is not over to the left of the puck, as one does with the “Weissman Pull”, and thus not telegraphing his planned open. Doing this though requires a speed and finesse which many lack, again, a basic fundamental when it comes to facing-off, no matter what open you attempt. Invitational Open: http://vimeo.com/album/2299270/video/61643222 As soon as the puck is released Albert Ortiz retreats from the puck and “invites” Brian Accrocco to take a shot, which ends up becoming an easy capture for Ortiz as the accuracy and speed of a shot, among other things, taken from a normal face-off position is usually significantly poorer than is the speed and accuracy of a “normal” shot. Crock Shot: http://vimeo.com/album/2299270/video/61643221 Here Travis Luscombe simply pushes the puck forward before Paulo Correia can “get” it with his attempt at an Australian open. By swinging past the puck to the left without grabbing the put, Paulo leaves his goal wide open, giving Travis an easy score with his quicker standard open. As we have seen with every past successful open, Travis’s standard works only because he is faster than Paulo; despite the fact that the pushed straight “crock shot” works well against the Australian open, Paulo would most likely have still captured the puck if he was able to make contact with it before Travis. 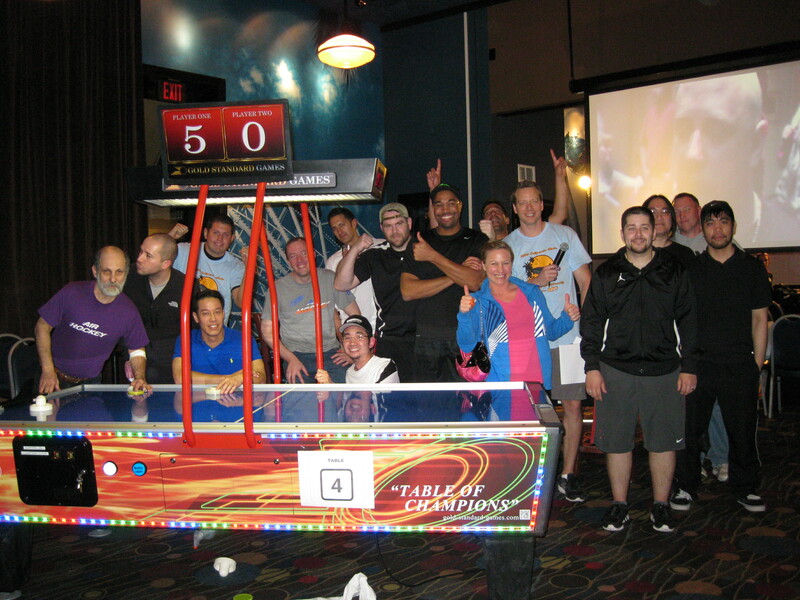 Air Hockey’s World Championship took place Oct. 17-20 at the Brunswick Zone in Naperville, IL. 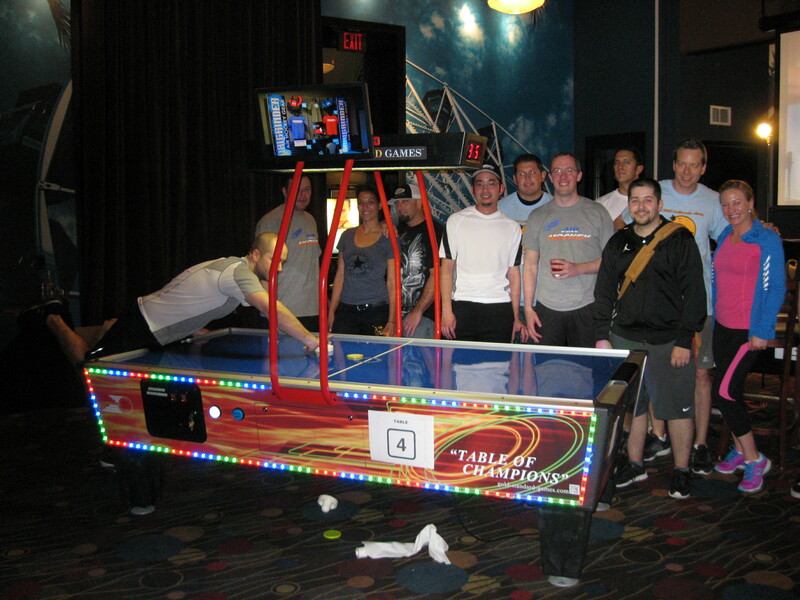 The event was sponsored by Gold Standard Games and World Championship Air Hockey. This was the 53rd World/National championship sanctioned by the USAA, starting with the first in 1978. And it was the first Worlds to be played on Gold Standard Games tables. Danny Hynes of Houston won his record-tying 11th World title in typical fashion for him: he had to fight his way through the losers bracket after being put there by Davis Lee of California, who beat him 4-2. Davis also beat 2012 Champion Billy Stubbs, who was the favorite coming in to win the tournament. So Davis was on top of the winners bracket waiting for whoever emerged from a tough losers bracket. Pedro Otero, who had captured the #1 World Ranking earlier in the year by beating Stubbs in a challenge match, suffered a surprise defeat early on to fellow Venezuelan Javier Pulido. Pedro managed to fight his way back to a 3rd place finish, along the way defeating 4 former World Champs: Mark Robbins, Tim Weissman, Ehab Shoukry, and Billy Stubbs. Pedro was finally stopped by Danny Hynes in an exciting battle that went down to the final 7th game. Davis had come into the tournament at the top of his game, having beaten both Ehab Shoukry and Danny Hynes in USAA challenges matches in the month before the tournament. So Davis came to the Worlds ranked #2 by USAA, although his seed and rating was only #4 due to differences in the Ranking and Ratings systems. But unfortunately for Davis, Danny was like the “Danny of old”, catching fire in the losers bracket and playing with great intensity with his back against the wall. Danny dropped only 2 games in beating Davis two sets to capture the title. Billy Stubbs finished 4th after being knocked out of the tournament by Pedro Otero, his nemesis who beat him in February in that challenge match. Fifth place went to former Champion Ehab Shoukry, followed by Brian Accrocco. Finishing 7th was 14-year-old prodigy Colin Cummings of Houston, the youngest player ever to finish Master (top 10) in a World/National tournament. Earlier in the year Colin had become the youngest Master via a challenge match victory. Rounding out the top 10 were August Parra, 8th; Tim Weissman, 9th; and Javier Pulido, 10th. Mike Cummings of Houston won the 17-24 bracket. The 25-32 bracket winner was Dionisio Diaz of Venezuela, and Houston’s Donovan Brown won the 33-48 bracket. Junior Champion (highest finisher 16 and under) was Colin Cummings. The Friday night Doubles Championship was won by Danny Hynes and Ehab Shoukry. On Thursday night, Chris Aston of Dallas won the Handicap (point-spot) event. In winning his 11th World title, Danny Hynes tied the long-standing record of Jesse Douty. Jesse won 11 titles between 1978 and 1988. He was dethroned in 1989 by Tim Weissman, who went on to win 10 titles of his own. Danny pulled ahead of Tim by winning this year’s Worlds. To see more details on the 2013 Worlds, got to http://www.airhockeyworld.com (or http://www.airhockey.com) and you can see charts and individual match details. Videos from the tournament should be online soon, check back for details. 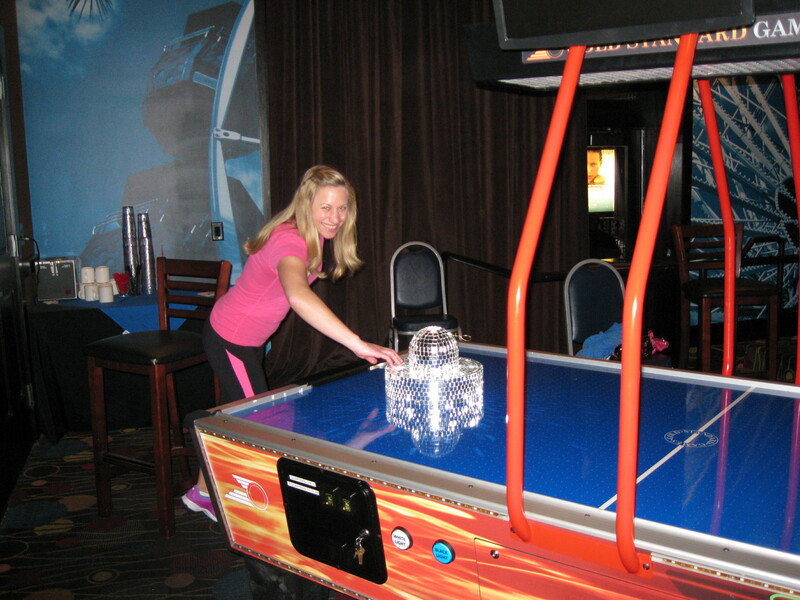 The 2013 California State Air Hockey Championships took place on February 23 at Dave & Busters in Irvine, CA. The event was sponsored by Gold Standard Games, Dave & Busters, Proairhockey.com, and several other businesses. Tournament organizers Cory Dzbinski and Kim Wenskay of Proairhockey.com were pleased with the response to their first state-level event. Media coverage included an extensive segment on San Diego Union-Tribune’s UT-TV. Winning the tournament was current USAA World Champion Billy Stubbs of Chicago. Second place went to Davis Lee Huynh of Sunnyvale, CA, a 2-time World Champion. Joe Cain of San Ramon, CA was 3rd, followed by Donovan Brown of Houston, TX. What do Hugo Chavez and Air Hockey have in common? Not much, except that both are making big news in Venezuela right now! Last month Caracas resident Pedro Otero flew up to Chicago and stripped the number one ranking, in the wonderful world of Air Hockey, from three-time world champion Billy Stubbs. Otero beat Stubbs four sets to two, twenty-one games to sixteen, a major upset in the eyes of the professional Air Hockey community. This isn’t the first time Venezuela has caused quite an upset in the world of Air Hockey either! It all started in 1990, when several arcades began popping up across Venezuela, challenging a law established in the 70’s which banned all coin-operated games in the country. Then, in 1992, amongst political outrage, including police raids on arcades to confiscate what leaders saw as “brain-stealing machines,” the arcades fighting for survival across Venezuela culminated in the birth of La Ciudad de las Maquinitas, the first “large” arcade in Caracas, Venezuela’s capital. This arcade became the father of Venezuelan Air Hockey, pioneering the controversial, coin-operated, sport. Following a letter of invitation to the 1993 Santa Cruz Nationals from the United States Air Hockey Association, La Ciudad de las Maquinitas even agreed to help finance a trip for two of their local players, Waedi Hassan and Argenis Montilla, who, despite not knowing an inkling of English, wished to attend the tournament. La Ciudad de las Maquinitas paid for 80% of the players expenses, obtained Visas and passports for the two, and even convinced a Venezuelan airline to sponsor the pair. Hassan and Montilla returned to Venezuela with the first and second place trophies in the Amateur Bracket, and, thus, professional Air Hockey in Venezuela was born. Down the road a couple of years, in the fall of 1995, a young 17 year-old Venezuelan player named Jose Mora came to America to play. The event was the 1995 Internationals, held in Colorado, and, to everyone’s surprise, Jose took fifth. The American player base thought his finish was amazing, but most likely a fluke. Jose showed up three years later in 1998, making history yet again. He took first-place, and became the first person from a country, outside the U.S, to become the number one ranked player. Mora then came back to win again in 99’ and 2000, refusing to give the champion title back to American hands, until he finally succumbed to ten-time world champion Tim Weissman in the 2001 national championship, placing third. Jose though, was not the only Venezuelan to make several outstanding finishes. Pedro Otero finished second in all three nationals Mora won, losing out to the Venezuelan champion each time. The very same Pedro Otero has yet again pushed Venezuelan Air Hockey into the lime-light, becoming not only the second Venezuelan to hold the number one U.S.A.A ranking, but also the second person from a country other than America to do so period. The battle for first, however, will not be conceded by America so easily; come late April Pedro “the Eagle” Otero will face off against five Ultra-pro level American players in Houston, Texas, in defense of his number one ranking by the U.S.A.A. Pedro will play Ehab Shourky, Tim Weissman, and Danny Hynes, all three of them former World Champions with two, ten, and ten national wins under their belts, respectively. However, his challenge won’t end there. Pedro will also spar once again with three-time world champion Billy Stubbs, still considered by most in the Air Hockey community to be playing better than any other current player, and, this time, Stubbs is out for revenge. What Pedro Otero is attempting is completely unprecedented in the sport of Air Hockey. He is planning, in the span of two weeks, to play, and hopefully beat the top four players in the sport, and in full length challenge matches no less. That means Pedro will be playing anywhere between 140 and 180 games in under fourteen days. Considering most of these games will be against, literally, the best players in the world, each and every one will take tremendous power, focus, determination, and strategy if Pedro hopes to win. This is a serious undertaking for “the Eagle”, both mentally and physically, especially when it is considered that those he plays near the end of his campaign will be “fresh”, while he will no doubt be tired and sore. That being said, Pedro is determined. After finishing second for years, he wants to completely and utterly expunge the negative stigma of being “second.” Pedro wishes to prove he is number one, that he is just as good as Jose Mora, his fellow Venezuelan. This is certainly the way to do it, beating the best of the best all in a row, only days apart. Pedro is putting it all decisively on the line. Either he will be the best, or he will not. So, as most of the world watches and waits to see what Chavez’s death will bring, those of us here in the Air Hockey world will be watching and waiting, to see what this epic clash of champions brings about. We will be waiting to see if a new era of Venezuelan dominance is upon us or, if America will take back her title again, as she did in 2001, and if, when all is said and done, Pedro Otero is number one or number two. What is a pot shot? A pot shot is an unexpected shot that is taken earlier in the offensive cadence than normal and is usually executed away from the centerline. Pot shots can be planned or used opportunistically if the defense is out of position. A pot shot does not simply have a shortened release nor is it a desperation chase. For players who primarily use a controlled attack at the centerline, pot shots can add another layer of deception, but only a handful per game should be used. Offense should consist of around 10-20% pot shots, which is a significant enough frequency of use that pot shots deserve a legitimate strategy, and some love. Surprising the defense by breaking an established cadence is the most compelling reason to take a pot shot. Because of this, their use should not exceed 50%. When pots shots exceed 50% almost all of the unexpectedness is lost, which is equal to attempting more difficult shots with little to no benefit. Master elite players normally shoot between 10-20% pot shots. Wil Upchurch and Ehab Shoukry are both top-5 rated players with great offenses; they are also on different ends of the pot shot spectrum. Wil has one of the quickest paced offenses of all time and routinely uses pot shots as part of his deranged attacks. On the other hand, Ehab has one of the most controlled offenses. He relies on precision, power and gains deception from his releases while he executes almost all of his shots from a planned and controlled drift. Wil has the best pot shots in the history of air hockey, yet he only executed them 34% of the time, well below 50%. Wil understands that surprise is crucial to their effectiveness. What can be learned from Ehab’s meager 12% usage? It is clear that even the most controlled attacks benefit from using pot shots. Ehab’s pot shots were actually more effective than Wil’s based on the success rate of pot shots attempted. This is largely due to Ehab’s infrequent use of them, which will increase their success rate when he does shoot pot shots. Ehab executes a normal left-wall-over, then a chase cut and pot shot right-wall-under. The pot shot in this instance can be more specifically defined as a one-two. This sequence works because Ehab generally catches the puck and resets before drifting. It is especially effective because the chase cut produces momentary chaos; Ehab capitalizes on this with an immediate pot shot. Ehab elects to hit a pot shot after circling around the puck. The circling movement causes Wil to think that Ehab is going to grab the puck and reset. Ehab capitalizes on Wil’s lapse of focus by sinking a textbook pot shot left-wall-under. After a successful charge, Wil grabs the puck at the centerline, which leaves the puck in a still position for a fraction of a second. He then quickly transitions into a right-wall-over. I use the term stop-and-go to define this sequence. The stop-and-go pot shot causes Ehab to overreact to the bank. This happens because Wil normally drifts after grabbing the puck. This sequence is sick! Only Wil can pot shot a forehand left-wall-over and follow it with a one-two left-wall-under smash at the rail. Player of all skill levels should execute between 10-20% pot shots. Straying from this range is usually symptom of an overly conservative or reckless offense. Mimicking and studying top players’ pot shots, like the ones in the above videos, is a good starting point for amateurs. Pros and above should be spontaneous and develop novel pot shots through experimentation. The exact frequency of use does not need to be known during a match while in the heat of battle. Once a player is aware of the appropriate frequency, a feel for what is correct will develop over time. 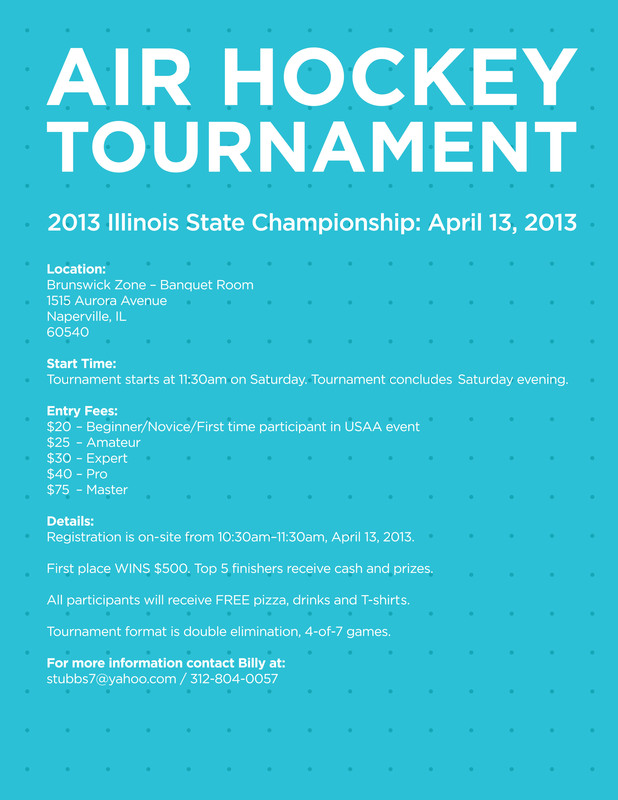 2013 Illinois State Tournament Announced!